As you read this article, you may think that I am simply relying on the clarity of hindsight and also over-simplifying greatly. Well, yes, but that is the nature of case studies – they purport to be forward looking but are not, and they abstract from complexity to draw out fundamental ideas. Case studies are historical and stylised, but they are also a crucial and highly effective part of ongoing learning. It is better to refuse to commence a negotiation than to start the negotiation from positions that are too far apart. The UK’s date of departure from the EU was crystallised when Article 50 was invoked on 29 March 2017. In June of 2017 the EU proposed a two-stage negotiating process. In the first stage three issues crucial to the EU would be agreed upon: The status of EU citizens in the UK; the UK’s share of EU liabilities; and the avoidance of a physical border on the island of Ireland. Only after agreement on these three matters would the two parties commence a transition during which a free trade deal would be negotiated. On one level, the EU’s two-stage process, and insistence that its concerns be given primacy, was unusual. But, at the deepest level it was normal. One party sets out a position – a line in the sand. The second party must then decide whether that offer is a reasonable starting point for the negotiation. If the second party counters with its own offer (its line in the sand) then the implication is that it believes the distance between the lines can be closed by negotiation. It is inevitable, once lines in the sand are drawn, that each party giving up about one half of the distance between the positions, will be the starting point for continuing negotiations. But, instead of making a counter offer, the second party might simply refuse to accept that the first party’s initial offer is a realistic or equitable starting point that can lead to a deal. In that case, either the first party has to make a new offer, or both parties have to accept their best alternative to a negotiated agreement (BATNA). I realise this is pretty basic, but it does characterise the crucial choice faced by Theresa May and her Cabinet after the EU’s initial offer. They needed to decide whether the EU’s position was a realistic starting point, or alternatively, whether it should be rejected. To decide in favour of proceeding the PM needed to be able to credibly articulate what an agreement on the Irish border question, that was acceptable to both sides, would look like. It was obvious that her own party would not accept any agreement that gave Northern Ireland a status separate from the rest of the UK. The importance to UK Conservatives of the status of Northern Ireland is evident in the naming of the governing committee of their parliamentary wing. It is called the 1922 Committee, where 1922 references the year in which the Republic of Ireland was established. Theresa May should have said that the EU’s insistence on no hard border in Ireland was not a starting point for negotiation unless the EU’s negotiator Michel Barnier could describe an arrangement that did not give a separate status to Northern Ireland. The UK PM did not have to accept the EU’s starting position, and to do so without having a convincing description for how a deal could be reached was reckless. A negotiator who represents a decision-making body, such as a corporate board, must work as hard on building support in that body as on the negotiation itself. PM May has, of course, been negotiating on behalf of the UK’s Parliament, which in turn represents the British people. Likewise, Michel Barnier speaks for the EU Parliament which represents the EU citizenry. It is common for negotiators to be acting as agents. In takeover deals for instance, investment banks negotiate on behalf of the governing boards of companies which in turn act for their shareholders. As an agent, May needs the support of the body she acts for – the body that will ultimately say yeah or nay to the agreement she brings to them. The Chair of a corporate board needs to keep board members well appraised of negotiations and to build support. Likewise, Theresa May needed to make building support in her own party (no easy matter), and reaching across the aisle in the House of Commons, her highest priority. Instead May did the opposite. Rather than seeking a bi-partisan approach with the opposition May called a General Election in an attempt to exploit the perceived weakness of the Labor Party’s position. The failure to even attempt to build support in the body she represents was clearly a mistake. US President Woodrow Wilson made the same mistake in 1919. When the newly elected Democrat President sailed to Europe to participate in the Versailles Treaty negotiations, he did not invite a single Republican Senator to accompany him. However, the US Constitution gives the power to ratify foreign treaties to the Senate. So, we should not be surprised that Wilson’s signature creation, The League of Nations, was never joined by his own United States. Improving your best alternative to a negotiated agreement (BATNA) is just as important as securing concessions from the other party. A party to a negotiation will generally get a better result if it can improve its own BATNA or degrade the other party’s BATNA. The UK’s BATNA is a no-deal Brexit in which trade between the UK and the EU will be governed by World Trade Organisation (WTO) rules. When the EU insisted on ‘its deal or no deal’, it was explicitly limiting the UK’s BATNA to the WTO rules. In response the UK needed to make that outcome less costly by beginning preparations for a no-deal Brexit. That is the only rational response to the EU delivering a ‘take it or leave it offer’. If WTO rules are your only alternative, then you had better start working on improving that alternative. 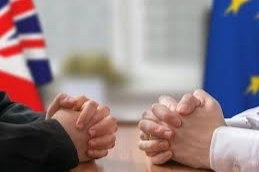 Actively preparing for a no-deal Brexit from June 2017 onwards might have damaged investment in the UK and made a bi-partisan approach in the House of Commons more difficult.Nonetheless, there is no excuse in a negotiation for simply ignoring your own BATNA. You might think that you can box your ‘opponent’ in. But they are likely to upend the table if your position is perceived as trapping them into a highly inequitable outcome. The UK PM’s strategy for concluding the Brexit negotiations is to give her own Parliament the choice of either voting for a deal it does not believe in or facing a chaotic and highly damaging reversion to WTO rules on 29 March. May is banking on the UK Parliament either accepting a small loss and giving the EU a big win by voting for the deal, or alternatively, accepting a large loss and giving the EU a small loss by voting it down. The UK Parliament voting for the lesser or two evils (from its perspective), may be more rational, but that doesn’t mean it will happen. Consider a game in which you are given a $100 but must offer me a part of the $100 in order to keep the remainder. If you offer me $20, then I am going to reject the offer and we will both get zero. That is irrational in an unrepeated game, but equity trumps reason in many human transactions. Concern for equity is hardwired into us from our hunter-gather origins in which survival is predicated on sharing and reciprocity. Lately, the Irish PM Leo Varadkar has been saying at every opportunity that the EU, and Ireland in particular, does not want to ‘trap the UK into anything’. He seems to be realising that the original take it or leave it offer of the EU may culminate in a lose-lose outcome for the UK and Ireland because of its perceived inequity. My Finance Education for Investors course now includes a class on negotiations. The class takes participants through the essentials of negotiating effectively in: buying and selling property; buying cars; obtaining mortgages and commercial loans; setting fees with financial advisors, lawyers and accountants; and much more. The next course begins on April 30 (windlestone.com.au/Melbourne).